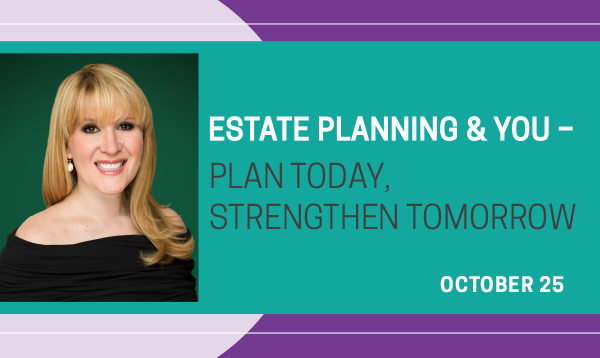 Please join us for an important conversation with Lindsey Markus on estate planning and wealth protection. Regardless of income or marital status, estate planning is a vital part of your financial plan. Planning ahead can give you greater control and security of your legacy. Lindsey will review the basics of estate planning and other important concepts so you can plan your estate with confidence. Lindsey Markus is a shareholder with the law firm of Chuhak & Tecson, P.C. where she heads the firm’s 22-attorney estate planning and wealth protection practice group. Lindsey draws on her background in finance and business to provide clients with creative solutions that meet their needs. She is on the cutting edge of sophisticated estate and succession planning, tackling such diverse subjects as assisted reproductive technology, cryptocurrency and how income tax planning is the new estate tax. Lindsey was the first woman shareholder in her firm’s 30-year history and she is an advocate of professional and personal development on everything from marketing to work-life balance. Lindsey has appeared on WCIU, FOX and NBC, regularly publishes articles and was recognized this year by Crains as a woman making an impact in the law. She also leverages her tax knowledge to educate donors and nonprofits on how to effectively leverage their giving. She leads by example and has been recognized for her exemplary dedication and contribution to Chicago’s Jewish community. Lindsey created her own website as an educational tool for clients and advisors – www.LindseyMarkus.com.